The Department of Physical Education was founded in 1993. During the existence of the department, masters of sports, honored coaches and excellent national education teachers teach. Classes are held at 1.2 university courses. The aim of teaching is the introduction of physical culture and sports of the daily life of students, identifying the strongest athletes to participate in inter-regional. Republican and international competitions .. The tasks are to familiarize students and employees of LASU with regular physical education and sports, and to conduct year-round sports and recreational events. 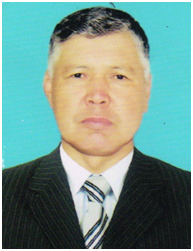 At this time, the Department of Physical Education and Sport is headed by Candidate of History, Associate Professor Dooronov O, and the Department of Physical Education is an excellent student of FC and Sports, Associate Professor K. Azhibaev. The department “Physical Education” conducts classes between the faculties. The department has 16 types of sports and fitness sections, including: volleyball, basketball, football, chess, toguz korgool, Greco-Roman wrestling, freestyle wrestling, kuresh, table tennis, etc. According to the results of the above sections, 3 students of the Central Asian champion in Greco-Roman wrestling, 2 champions in freestyle wrestling, at the IV Olympics in the southern region of 13 types, our athletes in 11 types took the 1st place. And in 1995, our students, taking part in the Universiade 1995 between universities, took the 5th place. At the II Games in 2000 held in Osh, Z. Asilova took 1st place in table tennis, and Molosheva G. in volleyball. And at the III Games of the Republic in 2002, held in the city of Kara-Balta, 33 athletes participated in the Zhagu and took 2nd place in volleyball and athletics. At this time, the department of “Physical Education” holds all the educational events on the development and improvement of cultural, sports and recreational works of students and faculty of Zhagu. In addition to these faculty members, the department participates in various cultural, scientific and practical events held at the university. 3. Sports field size 50×30.